Was it another gas attack against civilians (deemed rebels) by Syrian dictator Assad? It would seem like a lunatic move, especially after the destructive retaliation visited upon Syrian airfields last time it happened. But even the initially skeptical (such as Britain’s Theresa May) seem convinced that the chlorine gas attack could only have been carried out by the Syrian military. Despite Russian, Syrian and Iranian denials, Israeli intelligence says so, as do a slew of current and former officials. Now, particularly after President Trump’s warning of a U. S. military response, many are expressing fear that any reprisals could spiral out of control and put American forces in a combat situation with the Russian military. Russian television has gone so far as to instruct viewers on the construction of fall-out bunkers in case of a nuclear exchange. But nothing has happened yet, despite the urgency of reporters and their “expert” panelists. Presumably every precaution is being taken to verify the source of the poison gas, said to have been dropped by military helicopters. No doubt the president is weighing all options while entertaining conflicting advice as is his habit. Russian warships have reportedly vacated Mediterranean ports, with some saying they’ve fled for safety and others that they’re prepared to attack American ships in the event missiles are fired. Meanwhile, fireworks are going off over the release of former FBI Director James Comey’s tell-all book, which reinforces his agonizing over trivialities. ABC promised bombshells. But other than his comparing President Trump to a Mafia crime boss, there don’t seem to be any. He’s still got another eleven interviews scheduled to promote book sales, maybe he’ll cry! Meanwhile, the first salvo of the long-awaited Inspector General’s report dropped today, which was probably not the best timing for Comey’s book tour. It verifies what we’ve known for months, that recently fired Andrew McCabe “lacked candor” on several occasions (translation – he lied), some of which were under oath. That is apparently the reason Mr. McCabe was terminated only hours before his retirement was due to kick in. The perceived unfairness of it all among those who want the President impeached or charged with a crime has allowed McCabe to raise hundreds of thousands of dollars from the public for his legal troubles, assuming he has any. This week we saw something historic, with the FBI raiding the offices and residences of the President’s personal lawyer. It’s virtually unheard of in the United States, certainly it’s never happened to the personal attorney of a sitting president. But maybe there was evidence of some enormous crime in the process of being purged. Then again maybe the most respected law enforcement agency on earth is up to the kind of shenanigans that have produced a year and a half of leaks, false analysis, fake news and speculative bombshells that have yet to detonate. The whole truth about those who went to extraordinary lengths to reverse the results of the 2016 election? We just hope we live long enough to see it resolved. At the moment it seems doubtful. P. S. Last weekend we were in Dalton, GA for the Last Day of Unleavened Bread and the Sabbath, along with a group of sixty some in attendance. Mr. Robert Nunnery was the host and master of ceremonies. We got to hear from several speakers representing groups from Atlanta to Nashville and others. Once again, Mr. Nunnery explained how gay it made him feel to host the event, according to the original intent of the word. But it still got a big laugh. The banquet room was packed, and it was great to be present with all those fine folks. 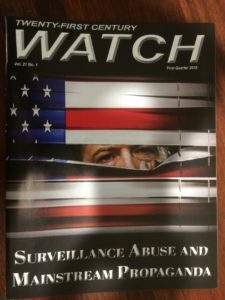 P.P.S The latest edition of Twenty First Century WATCH is published and in the post to subscribers. Request you free copy today. In light of Mr. Comey’s book and Mr. McCabe’s confirmation as a liar the cover, and cover story, is prescient. In the US and North America call (903) 561 7070. In Australia call 1300 885 066. From anywhere in the world email gta.info@ozemail.com.au with your name and postal address. A copy will be posted to you free of charge.